Have you ever wondered what it was like during the plagues? It seems beyond imagining to endure multiple waves of destruction, as the Egyptians did. Hail wipes out your crops. Disease destroys all your cattle. And on and on, ten times. If you don’t recall what happened, Oklahoma, Kansas and other western states experienced a farming boom in the 1920’s, and millions of acres of grassland were newly plowed and sown in wheat. At first they had bumper crops, but just few years later, a multi-year drought set in and decimated the land. For several years, massive dust storms blackened the sky for days at a time. They called them “black blizzards” because at times were so blinding that you couldn’t see even a few feet in front of you. Livestock died from dust inhalation, and farm buildings were buried in several feet of dirt. Exodus commentaries point out that this is likely what the plague of darkness was, when Egypt experienced three days of darkness that could be touched. (Exodus 10:21-22) Dust is “touchable” darkness. 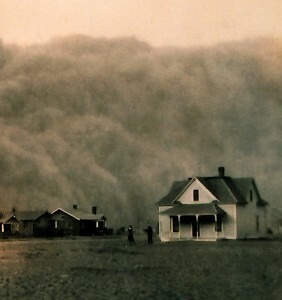 The Middle East occasionally experiences dust storms like Oklahoma in the 30’s. I’ve experienced the more mild hamsim more than once in Israel, when a hot east wind from off the Sahara fills the sky with dust, turning it brownish-grey. 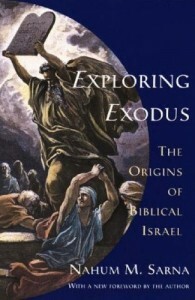 In Exploring Exodus, Nahum Sarna notes that the first nine plagues could have had natural causes. Hail, cattle disease, locusts, and the like are all well known in the Middle East. The miracle wasn’t that God caused unearthly events to happen. It was that the God of all creation had acted through nature to show his power, and Moses predicted exactly when he would do so. But Sarna adds that the final plague, the death of the firstborn of each family, was utterly outside of human experience. It defied all rational explanation. “It must be clear to all, and beyond the possibility of misinterpretation, that what took place can only have emanated from a divine source,” he writes. (p 78). What struck me as I watched the Dust Bowl documentary was how much it must have felt like living through the plagues of Egypt. The settlers were hit by wave after wave of destructive forces. The massive drought forced hungry rabbits to invade and eat everything in sight, even tree bark. Later, clouds of grasshoppers descended to wreak more havok. And of course, the Depression made it impossible to sell any crops that did grow. Many children died from what they called “dust pneumonia” – lung inflammation brought on by continual dust inhalation. The drought imagery reminded me of many other passages in the Bible. The settlers’ longing for rain sounded as if they were dwelling in a parched and weary land where there is no water (Psalm 63:1). If you want to learn a little American history and also get a taste of the plagues of Egypt, check out this fascinating documentary. I never thought of the plagues as earthly causes. But that is what they were. And as you said in the last plague, the last one totally defied earthly power. I just assumed that God just made them up, but those plagues were common in the Middle east. God was just showing that He could control nature. When I read the Bible and especially the plagues it always made me think. I could never imagine having that happen today. But as you said the miracle wasn’t that God made these things happen but that he acted through nature to show his power. Also I never really realized that these things are common either. The more we think about it we realize that things like this happen often. Maybe not so much dust bowls or locusts now but especially hurricanes and earth quakes.